276 acres by CC and WCB-2005• funded The Nature Conservancy’s $13 million acquisition of 276 acres at Ormond Beach from the Metropolitan Water District and the City of Oxnard for restoration of wetlands and other wildlife habitat. The property is adjacent to 265 acres that the Conservancy purchased for restoration in 2002 and other neighboring properties that are being considered for restoration. 1-27-05 -- disburse up to $12,972,000 to the Nature Conservancy for the acquisition of approximately 276 acres at Ormond Beach in Ventura County for restoration of wetlands and related habitat. 265 acres by CC- 5-23-2002--The Conservancy authorized disbursement of up to $9,700,000 for the acquisition of approximately 265 acres of property at Ormond Beach, Ventura County, to implement a portion of the Wetland Resources Enhancement Plan for Southern California Edison Coastal Properties approved by the Conservancy on February 24, 2000. -10-23-2003--The Conservancy approved use of $600,000 to plan for restoration of wetlands and dunes at its 265-acre property at Ormond Beach, and reserved $23 million for purchase of an adjacent 500 acres in 2004 owned by the MWD, Oxnard and Southland Sod at Ormond Beach. Together, the properties will provide the setting for a large-scale environmental restoration that will greatly benefit a variety of wildlife, particularly resident and migratory birds. 14 acres in fee and 16 acres in conservation easement by CC--2004--funded the Ojai Valley Land Conservancy’s $450,000 purchase of the 14-acre Confluence property on the Ventura River. The acquisition is a key element of a broader plan to preserve and protect habitat for fish and wildlife and to expand recreational opportunities along the river’s mid-section. 2-19-04 --part of the Ventura River Parkway in Ventura County. 1416 acres by CC-1-23-2003--A $3.1 million grant from the Coastal Conservancy enabled the Ojai Valley Land Conservancy to purchase a 1,416-acre property on the Ventura River . The purchase is critical to plans for recovery of the river's endangered southern steelhead trout, and will allow people to experience the beauty of the county's natural lands that remain along the river. 5-27-04-- disburse up to $55,000 to the Ojai Valley Land Conservancy to augment funds, authorized by the Conservancy on January 23, 2003, to preserve, restore, and provide public access to Farmont Ranch, on the Ventura River adjacent to the City of Ojai, Ventura County, specifically for the restoration of trail corridors for habitat and erosion control. 9-15-04 Consideration and possible Conservancy authorization to disburse up to $200,000 to the Ventura Hillsides Conservancy (VHC) to prepare acquisition planning and feasibility studies for the Ventura Hillsides. 700 acres by CC-2003--The Conservancy provided $3 million for purchase of about 700 acres along two miles of the Santa Clara River . The properties will add to the Santa Clara River Parkway, created by the Coastal Conservancy and the Nature Conservancy to protect farmland, manage floodwaters, and restore the natural environment along Southern California's largest river. 120 acres by CC-2002--The Conservancy authorized acquisition by The Nature Conservancy of two additional properties, totaling 120 acres, to implement the Santa Clara River Parkway Conceptual Enhancement Plan pursuant to the Conservancy resolution of June 2001. 1100 acres by CC-2001--$1,300,000 to the Nature Conservancy for the acquisition of properties totaling approximately 1,100 acres as part of the Santa Clara River Parkway, Ventura County. 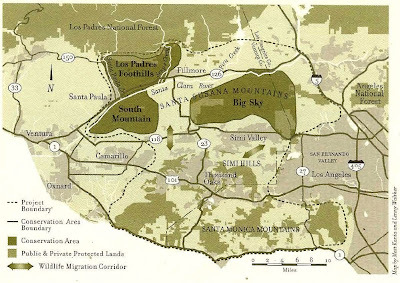 2983 acres by CC and WCB--9-25-2003--The Conservancy contributed $10 million to the State's purchase of the 2,983-acre Ahmanson Ranch , enabling the protection of valuable wildlife habitat and the availability of natural park lands in a rapidly developing area. The ranch is in the upper watershed of Malibu Creek, and the purchase complements extensive restoration work being conducted downstream by the Conservancy and its partners. 58.8 acres in Thousand Oaks-by WCB -- received the Joel McCrea Ranch donation. 0.67 acres by CC--2005• granted the County $300,000 for the acquisition of three vacant blufftop parcels on Del Playa Drive in Isla Vista for a park that will offer spectacular panoramic views of the ocean. The Conservancy also provided the County with $150,000 to reconstruct three public beach accessways in the City that have frequently washed out during major storms. 6-16-05 and 1-27-05 Isla Vista. 750.6 acres by CC- 4-25-2002--$200,000 to the Land Trust for Santa Barbara County to acquire conservation easements over two properties owned by the Hvölboll family, including the 745-acre La Paloma Ranch and an additional 5.6-acre property, on the Gaviota Coast. 143 acres by CC 1-2008: Paradise Beach for conservation of open space and dunes habitat, Point Sal, northern Santa Barbara County. 20 acres by CC-2005• provided the Trust for Public Land with $190,000 for its option to purchase the 20-acre Piedras Blancas resort property and its management of public access to two sandy beaches, trails, and a parking area at the site. The property contains one-half mile of shoreline in the midst of the extensive Hearst Ranch properties that the State acquired in 2004. Piedras Blancas Resort in northern San Luis Obispo County. Hearst Ranch, 1467 acres bought and 80,000 acre conservation easement by CC, WCB and SP--2004—CC contributed $34,500,000 for the acquisition and protection of interests in the 82,000-acre Hearst Ranch. Additional public funds included $34.5 million from the WCB, $23 million from CalTrans, $3 million from State Parks, and Hearst will get a $15 million tax credit. The purchase will open an 18-mile stretch of coastline to the public and protect over 80,000 acres of farmland and natural lands east of Highway 1 while allowing continued use of most of the ranch for farming and ranching and 27 homesites and 15 employee housing units on the inland part of the ranch. Also includes acquisition of interests in the 906-acre Junge Ranch east and west of Highway 1 by a nonprofit organization and the State, through use of tax credits or otherwise. Of the land sold to the State, 949 acres goes to State Parks and 518 acres to Caltrans for a project relocating Highway 1. --7-16-04 parks comm.--Hearst Conservation Plan-- State Parks would not be investing in the purchase but would accept fee title and management responsibility for the 13 miles of coastline. 9-17-04 parks comm --State Parks had been concerned that the agreement originally included stipulations that limited access to the coastal trail, but that negotiations with the landowner resulted in a lifting of all restrictions. 106 acres by CC 4-24-2003-- disburse up to $250,000 to the Nature Conservancy to assist in the acquisition of two parcels comprising 106 acres, known as the Williams property in the community of Cambria, San Luis Obispo County, for purposes of natural resource protection and viewshed preservation. 746 acres by CC/WCB/SP-2-27-2003--The Conservancy provided over $6.6 million for the State's purchase of the 746-acre Sea West Ranch on Estero Bay between Cambria and Cayucos along the Harmony coast. The purchase ensures protection of one of the largest coastal prairie grasslands in the State, and provides a site for a three-mile addition to the California Coastal Trail. also 2001--$$200,000 to the Cambria Community Services District for the preparation of a Public Access Management Plan for the East-West Ranch property located in the community of Cambria, San Luis Obispo County. 1.6 acres by CC--10-23-03-- disburse an amount not to exceed $200,000 to the Cambria Community Services District for the acquisition of a 1.6-acre parcel in the community of Cambria, San Luis Obispo County. --222 acres added to Carrizo Plain National Monument by the federal Bureau of Land Management for $118,500. 13 acre Rossi property by CC—5-18-2005• provided the Land Conservancy of San Luis Obispo County with $645,000 for its acquisition and restoration of the 13-acre Rossi property in lower Black Lake Canyon at the edge of the Guadalupe-Nipomo Dunes. The purchase protected freshwater marshland and other wildlife habitat from development. Black Lake Canyon Enhancement Plan. By CC 2-22-2001--$$665,000 to the Land Conservancy of San Luis Obispo County for the acquisition, management, restoration, and disposition of real property pursuant to the Black Lake Canyon Enhancement Plan. 270 acre Ahearn ranch by CC-2004--provided $400,000 to assist the City of San Luis Obispo in its purchase of 270 acres of the Ahearn Ranch along the headwaters of San Luis Obispo Creek and Highway 101. The acquisition protects a variety of wildlife habitats and offers opportunities for public recreation. 5-27-04 disburse up to $400,000 to the City of San Luis Obispo for acquisition of the Ahearn Ranch in the San Luis Obispo Creek watershed. 1860 acre Maino ranch conservation easement by CC-8-14-2003--A $1.5-million grant from the Conservancy enabled the Bay Foundation of Morro Bay to purchase a conservation easement on the 1,860-acre Maino Ranch, preventing its subdivision and development. The easement will help protect the natural and scenic resources of the Chorro Valley and Morro Bay National Estuary while enabling the Maino family to continue its ranching operation. 42 acres by CC/WCB-10-23-2003--The Conservancy contributed $1.25 million for a 42-acre addition to Montana de Oro State Park near the south end of Morro Bay. The purchase prevents commercial development of the site, protecting stunning coastal views and sensitive dune habitats. 10-23-03 acquisition of a 42-acre property. 580 acre Hammons property by CC/WCB-1-24-2002--The Conservancy approved the Hammons Conceptual Resource Enhancement Plan, and authorized (1) acceptance of $550,000 in U.S. 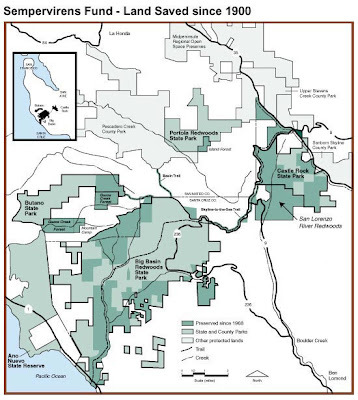 Fish and Wildlife Service grant funds; (2) disbursement of up to $1,200,000 to the Wildlife Conservation Board for acquisition of the 580-acre Hammons property, San Luis Obispo County; and (3) disbursement of up to $100,000 to the Bay Foundation for restoration planning. 80 acres by CC-2002--$750,000 to the Land Conservancy of San Luis Obispo County to purchase an 80-acre property and restore steelhead habitat along San Luis Obispo Creek. 540 acre Buckingham ranch conservation easement by CC-10-31-2002--$225,000 grant to the Bay Foundation for the acquisition of a conservation easement over the 540-acre Buckingham Ranch located in the Morro Bay Watershed. By CC 4-26-2001--The Conservancy authorized acceptance of public access and open space easements on property leased by Unocal Corp. along the Santa Maria River in southern San Luis Obispo County, and to transfer these easements to the U.S. Fish and Wildlife Service. 18 acres by CC-12-5-2001--$1,175,000 to the Bay Foundation to acquire approximately 18 acres on the south shore of Morro Bay, San Luis Obispo County. 3260 acres by State Parks at Hollister Hills http://www.parks.ca.gov/pages/712/files/ohv0319nr.pdf The Commissioners, in a 5 -1 vote with one abstention, amended the Hollister Hills SVRA General Plan for the development of two parcels, the 1,570-acre Hudner property, and the 1,690-acre Renz properties and their subsequent development for off-highway vehicle use. Commissioners also approved a final Environmental Impact Report (EIR) on the project, required under the California Environmental Quality Act (CEQA). Commissioners also approved the realignment of the 500-foot buffer between the SVRA and adjoining properties where no OHV recreation may take place. The vote was 6-1 with Commissioner Galvan voting no. While the land acquisitions total 3,260 acres, only about 53 acres are impacted by OHV recreation. 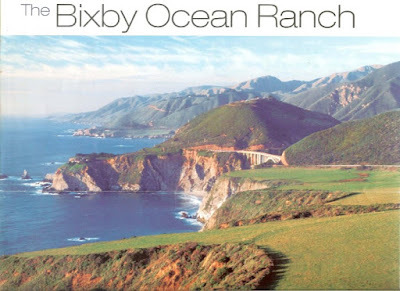 680-acre portion of Palo Corona Ranch , known as the “Gateway to Big Sur” just south of Carmel. The purchase will help open thousands of acres of spectacularly scenic land to the public and unite several parklands adjoining the ranch. 8 acres by CC-2007• provided $3.5 million to the Big Sur Land Trust for its purchase of two properties totaling about eight acres for the Carmel River Parkway. The properties contain buildings that could be converted to educational centers plus other facilities and sites for visitor services. Long-term plans for the Parkway call for protection and restoration of lands within the river’s ecosystem, development of educational facilities, and installation of a trail network connected to neighboring public lands. (January) 1-18-07 Carmel River Parkway in Monterey County. By CC 12-5-2001--$963,000 to California State Parks to obtain the property known as Hatton Canyon in Monterey County. 5-24-07 Closed session to confer with staff negotiators with regard to possible acquisition of interests in real property around the San Clemente Dam on the Carmel River in Monterey County. Also, to disburse up to $500,000 for engineering and technical studies for the San Clemente Dam Removal Project in Monterey County. 12 acres by CC 1-2008: disburse up to $500,000 to the Big Sur Land Trust for acquisition of the McWhorter Property for the Carmel River Parkway in Monterey County. 51.26 acres by CC and WCB-4-26-2001--$2,000,000 to the Big Sur Land Trust for the acquisition of the 51.26-acre Granite Rock Dunes property located in the City of Marina, Monterey County. 125 acres by CC 5-25-2000--adoption of the Martin Dunes Resource Enhancement Plan and authorization to disburse up to $500,000 to the Big Sur Land Trust for the acquisition of an undivided property interest in a 125-acre parcel located near the mouth of the Salinas River in unincorporated Monterey County. 22.6 acres by CC 1-26-2000-- disburse funds to the California Department of Parks and Recreation for the acquisition of a 22.6-acre parcel located in Moss Landing, Monterey County. 163 acre conservation easement by CC-2004--contributed $1 million toward the Monterey County Agricultural and Historical Land Conservancy’s purchase of a conservation easement over the Dolan Ranch on Moro Cojo Slough near Castroville. The easement will protect wildlife habitat and provide for restoration of wetlands along the slough while allowing the ranch to continue operation as a working farm. 9-15-04 Moro Cojo Slough. 151.5 acres at Elkhorn Slough and 38,905 acres saved through conservation easements in the Diablo Range at Bear Valley, the Varian Ranch and at Gabilan Ranch, and 4330 acres at Dorrance Ranch and 1674 acres at Arroyo Seco on the inland side of Big Sur. 2002- by CC-A $3,000,000 grant to the City of Santa Cruz for property purchases and improvements to the Santa Cruz Depot site. 94 acre Sand Hill Bluff by CC--2005• provided the nonprofit organization Agri-Culture with $2 million for its acquisition of the 94-acre agricultural portion of the Sand Hill Bluff property on the North County coast. Agri-Culture will lease and eventually sell the property as farmland. As part of the transaction, the coastal portions of the property became part of California State Parks. 3-10-05 Consideration and possible Conservancy authorization to disburse up to $2,000,000 to Agri-Culture toward its acquisition of the 94-acre agricultural portion of the 154-acre Sand Hill Bluff property in northern Santa Cruz County. 5-27-04 Authorization to amend the August 14, 2003 Conservancy resolution to eliminate one acceptance of an offer to dedicate a public access easement by the County of Santa Cruz from the conditions of the 26th Avenue Stairway construction project. 2-19-04 Consideration and possible Conservancy authorization to disburse up to $300,000 to the County of Santa Cruz to conduct site studies and environmental analysis, and to prepare applications to the State Water Resources Control Board for permits to appropriate water from streams on Coast Dairies property in Santa Cruz County for the irrigation of farmland. By CC 3-22-2001-acceptance of an offer to dedicate a public access easement to and along the shoreline of Antonelli’s Pond in the City of Santa Cruz. 289 acre Buena Vista property by CC and WCB plus 18 acre conservation easement--2004--CC contributed $1,160,000 toward the State’s purchase of the 289-acre Buena Vista property in the Watsonville Slough watershed. The property is home to several rare and endangered animals and plants. 2-19-04-- Consideration and possible Conservancy authorization to disburse up to $1,160,000 to the Wildlife Conservation Board for acquisition of the ±289-acre Buena Vista Property in the Watsonville Slough watershed, Santa Cruz County. 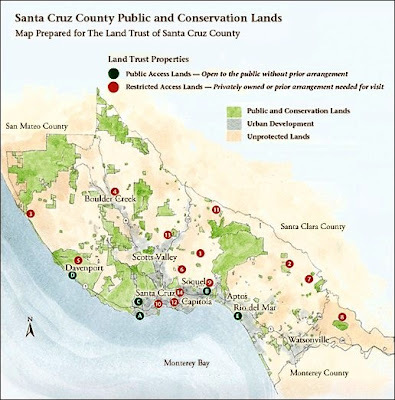 The Land Trust of Santa Cruz County owns, manages, or maintains conservation easements on more than 1,500 acres of land in Santa Cruz County, and has partnered to protect over 9,000 additional acres. The lands range in scale from small riparian corridors in densely urbanized areas to sizable tracts of redwood forest and working ranches. Each piece of land has some special quality that makes it worth preserving and maintaining. Formed in 2007, CCFW is just getting its feet wet in local forest issues. CCFW's staff person, Jodi Frediani, a long-time forest advocate, has kept busy this season on a number of projects. http://www.santacruzosa.org/, The Open Space Alliance of Santa Cruz protects lands with significant natural and scenic qualities, including rare wildlife habitat, watershed protection features, sustainable agriculture use and wildlife linkages between protected lands. Friends of Locally Owned Water (FLOW) grew out of a series of meetings held by Felton residents beginning in October 2002 to discuss the fate of the Felton water system. Seeks to bring public ownership to the region’s water system which is currently owned by California American Water Co.
devoted to providing financial options to landowners in order to protect the agricultural heritage of San Benito County. The San Benito Agricultural Land Trust currently protects 5,454 acres of working ranches and farms and is actively pursuing additional lands. The mission of The Big Sur Land Trust is to conserve the significant lands and waters of California's Central Coast for all generations. The Big Sur Land Trust has protected more than 30,000 acres of shoreline, wildlife habitat, streams, forests, grasslands and awe inspiring views. In the next 20 years, Monterey County is projected to grow by almost 40% to a population of over 500,000 people (an increase of 150,000 new residents). LandWatch will keep the public informed about the status of land use planning in the county. Monterey County Agricultural and Historical Land Conservancy, http://www.mcahlc.com/ dedicated to the preservation of the agricultural and historical resources of Monterey County. 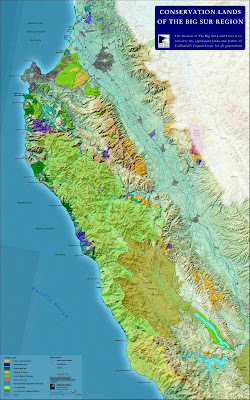 Click on “the easements” for maps of preserved propertiesThe Coastal Watershed Council, http://www.coastal-watershed.org, was formed in response to the declining health of the watersheds of the Monterey Bay region. Our mission is simple: we would like to restore the watersheds of our region and teach our residents how to become stewards of their local creeks and streams. or the preservation and protection of open space in the Pajaro Valley; Provide stewardship for the “last mile” of Watsonville Slough by preserving native habitat and wildlife, collaborating with the neighboring community and educating all who visit. The Environmental Center of San Luis Obispo, http://www.ecoslo.org/ With a downtown SLO walk-in Environmental Center office, ECOSLO offers information on current issues, county wide environmental services, plus a lending library of books, tapes, and videos. ECOSLO was instrumental in creating the SLO Coast Alliance, and continues to play a key role. The SLO Coast Alliance is a grassroots coalition of 45 organizations dedicated to protecting the county's spectacular coast against excessive development proposals. Campaigns of this sort safeguard the Central Coast from offshore oil production activities, ensure cleanup of oil spills, and promote long-term coastal protection initiatives. Greenspace has established five neighborhood Pocket Parks and one four-acre Forest Preserve and Trail. To preserve the rural nature of the Nipomo Mesa and surrounding areas, and to support sustainable growth in Southern San Luis Obispo County. 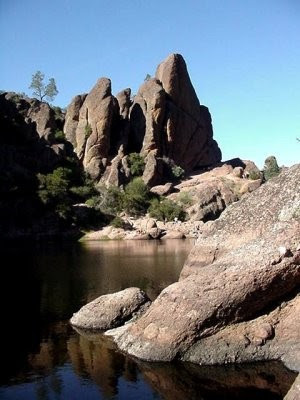 Land Conservancy of SLO County, http://www.special-places.org/The Land Conservancy was created in 1984. Since our formation, we have permanently protected over 9200 acres of land in San Luis Obispo County. The largest property is 5000 acres west of Paso Robles and is protected with a conservation easement and is owned by the Bonnheim Family which donated the easement. Friends of the Fiscalini Ranch Preserve holds the conservation easement over, and plans to manage for the public trust, a newly dedicated open space in Cambria, Ca. an evolving family of programs that changes and adapts with the environmental challenges faced on the South Coast. While our scope of work deals mainly with San Luis Obispo, Santa Barbara and Ventura counties, our influence and the bi-products of our innovation has and will be felt on state-wide, national and global levels. Seeks the permanent protection of the Gaviota Coast’s unique natural, scenic, agricultural, recreational, and cultural resources. The Gaviota Coast comprises only 15% of Southern California's coast, yet holds approximately 50% of its remaining rural coastline. The San Marcos Foothill Coalition has labored to protect the San Marcos Foothills property for nearly a decade. The 377 acre San Marcos Foothill parcel contains extensive native grasslands and high quality habitat, including the unique fanglomerate (boulderfield) on the West Mesa. The San Marcos Foothills is home to large numbers of rare animals, including grasshopper sparrows, burrowing owls and other locally important birds. In May 2006, the Coalition announced a deal with the developer to preserve 300 acres of the site. Santa Barbara County Land Trust,, http://www.sblandtrust.org/Since 1985, the Land Trust has worked with willing landowners, the community and public agencies to protect over 13,000 acres in Santa Barbara County.More Mesa Preservation Coalition, http://www.moremesa.org/committed to preserving More Mesa in the Goleta area. More Mesa consists of 300-350 acres of open space, with the County owning about 60 acres on the north end along Atascadero Creek. The 265 acres of bluff top is privately owned. Currently, 40 acres of the bluff top, next to Hope Ranch are zoned for development of 70 mansions. The remainder, almost 75% of More Mesa, was designated as environmentally sensitive habitat (ESH) during the 1993 Goleta Community Plan. This designation has been challenged by the owner. The County prevailed on the general plan ESH designation all the way through the state and federal Supreme courts. However, the courts allowed the owner/developer to again challenge this open space designation, if or when, a specific application for development of More Mesa is submitted. Thus, while the Goleta Community Plan designates much of More Mesa as open space, it could be overturned by the County, or others more open to development. dedicated to making Ventura County a better place to live by limiting urban sprawl, protecting open space and agricultural lands, and promoting livable and sustainable communities in Ventura County. 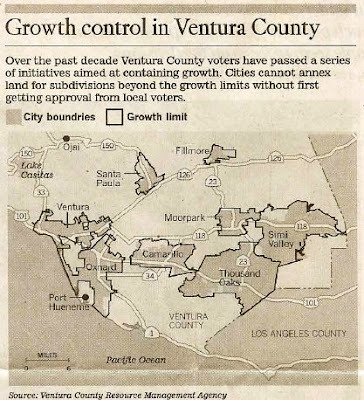 Since 1995, SOAR urban growth boundary initiatives which mandate voter approval of sprawl have passed in all major cities in Ventura County, and also on a countywide basis throughout Ventura County. No other county in the United States has more effective protections against urban sprawl. None! The Nature Conservancy launched its L.A.-Ventura Project in 1999. As of spring 2002, the project had acquired and protected lands totaling more than 1,100 acres, all along the Santa Clara River. We will acquire some 6,000 acres of land along the river to protect, restore, and enhance native riparian and alluvial habitats. In addition, working with partner organizations and agencies, The Nature Conservancy plans to establish a Big Sky Ecological Reserve in Los Angeles and Ventura counties. The reserve would encompass up to 10 contiguous properties totaling approximately 30,000 acres. 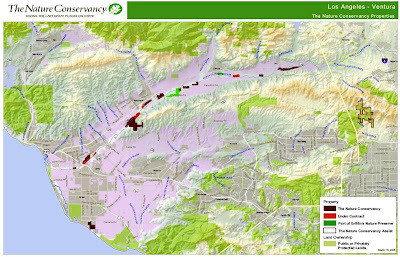 read more: January 12, 2007, LA Daily News, "Study Identifies Worthy Properties"
Note: in this map, light purple shading indicates agricultural land; grey shading is urban; green is preserved open space-- CLICK ON MAP TO ENLARGE! The Santa Clara River Parkway is a project of the California State Coastal Conservancy, in collaboration with the Nature Conservancy's LA-Ventura Project, Friends of the Santa Clara River, private landowners and local governments, to acquire and restore floodplain land along the lower Santa Clara River for habitat, flood protection, and recreation. Keep Sespe Wild Committee (KSWC) is a non-profit watershed conservation organization begun early in 1988, to preserve Sespe Creek, one of Southern California's last free-flowing rivers. Of the Sespe's 55 miles, 31.5 were given federal Wild & Scenic River status in 1991. Since 1997, KSWC has been working hard at fighting the Recreational Fee Demonstration Program, as it applies to the National Forests. Under this program, National Forests across the country are now permitted to levy a fee for entering. The Matilija Coalition is an alliance of community groups, businesses, and individuals committed to the environmental restoration of the Ventura River watershed. Starting with the removal of Matilija Dam, we are working for the recovery of the bioregion to benefit the recovery of the Southern Steelhead trout and to restore the natural sediment supply to the beaches of Ventura. http://www.cleanuprocketdyne.org/ dedicated to the proper clean-up and characterization of the Rocketdyne - Santa Susana Field Laboratory owned by Boeing, located on top of the Simi Hills. Environmental Defense Center, http://www.edcnet.org/ a nonprofit, public interest organization that provides legal, educational and advocacy support to advance environmental quality. EDC primarily serves community groups on California's South Central Coast. The Ojai Valley Land Conservancy is permanently protecting over 1,930 acres of open space, through direct ownership and management and a variety of conservation agreements. http://www.freeourforests.org/ a regionally active, grass-roots organization opposed to the U.S. Forest Service Adventure Pass program in Southern California, the Northwest Forest Pass in Oregon, and all other forms of the Recreational Fee Demonstration Program nationally.